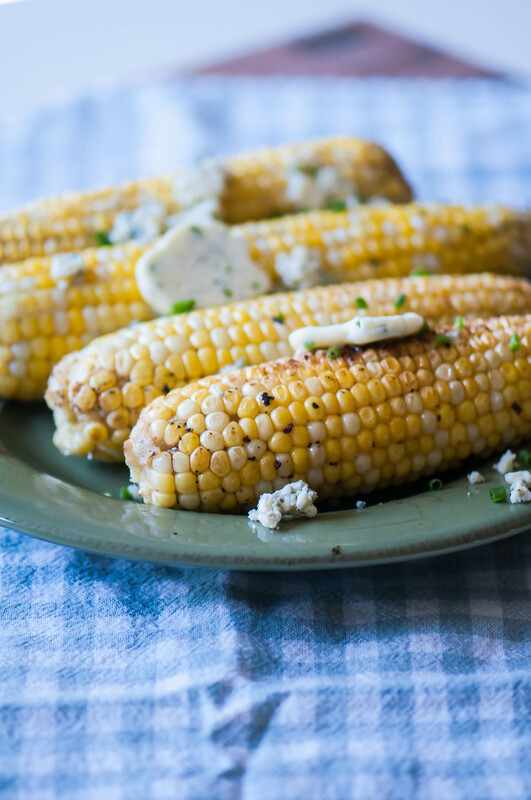 Add some personality to your corn on the cob this summer with this Grilled Corn with Gorgonzola Chive Butter. A simple compound butter takes your corn from plain to perfect. I love corn on the cob. I mean, it’s one of the few things my state is known for so I may get disowned otherwise. Sometimes nothing is better than a simple boiled ear of corn slathered in butter, salt and pepper. But that can get boring after a summer of cookouts and grilling so I’m jazzing up that corn today with the grill and a simple compound butter. As evidenced, I love a compound butter for adding variety to everyday food. So I created a new favorite for slathering on grilled corn. And it’s so good and super simple too. Stir crumbled gorgonzola and chopped chives into softened butter. Shape it into a log and place in the refrigerator. Aaaaand done. Seriously, so easy. If you soak the ears of corn in water for a few hours, you can grill them with the husks on which is what I usually do and did try originally with this recipe but it just wasn’t quite as flavorful as I had hoped. I wanted the corn to be buttery and really infuse with the flavors of the butter as well as ensure the cheese turned to melty goodness. So instead, I husked the corn, removed all the silk and wrapped them in foil along with the gorgonzola chive butter. Guys, you could hear the butter sizzling in the packets and it was glorious. The corn doesn’t get as charred and smoky with this cooking method but the butter really soaks in and infuses the corn. Buttery is better in this situation. Trust me. The chives provide a mild onion flavor and the gorgonzola adds a pungent, creamy element. It’s messy and flavorful and delicious. Just as corn should be. Make some extra butter and slather it on some steaks to make the tastiest summer meal. Add butter, 1/2 tablespoon chives and 1/4 cup gorgonzola to a bowl. Stir together. Lay out a piece of plastic wrap. Dollop butter onto plastic and fold both long sides over the butter and roll into a log about the same size as a stick of butter. Twist ends and place in refrigerator. Preheat grill to medium heat. Meanwhile, cut 4 squares of foil large enough to wrap the ears of corn. Place each ear on a piece of foil and season with salt and pepper. Cut butter into 12 equal slices. Add two slices to each piece of corn then wrap tightly. Set 4 remaining slices aside for later. Place wrapped corn on the grill and cook for 15 minutes, flipping every 5 minutes. Carefully unwrap the corn and top each with another slice of butter. Garnish with extra chives and gorgonzola.